We're on winter break right now so my sleeping schedule is reversed; I practically sleep at 5 AM and then wake up like noon or later just in time for lunch. Ah, the bliss that is vacation and laziness. I can't help but think it you know! I mean, if they lose just one game, it's really over and the 3rd years will be gone... There's another anime, and that was exactly what happened. In an instant, the 3rd years were gone and it was so heartbreaking for me to watch since they were all so charismatic as well and I came to like all of them. I am reading the manga, but I think I skipped too many chapters so I could catch up to the anime. I missed the chaps where you said Iwa and Oikawa were discussing college choices? I'm at chap 189 (I think) and I won't spoil it... the feeeeels. I love this manga and anime!! If you really can't wait for the anime (like me), than you should totally binge read the manga. The anime is still so effin good even if you know what's coming. I will be sure to read her works after I finish typing this comment. You can be sure of that. Ahaha, I feel you. I feel you. Since we also don't get to see them too often, so sometimes I forget them as well. I don't think I've see a BokuAka dj yet though? Please let me know if you know of one! Yachi is just cool. I normally don't like anime girls that much, but she's really grown on me. Bokuto:" Hey, hey, hey!! You know i-" -hit by Akaashi. "Sumimasen! We'll make sure not to disturb you again!" Haha. At least you can put into words how much you like the show! I can't even describe why I like this show... The art is just soo good and unique and the comedy cracks me up every time. I like too many of the characters.... But I'd have to say Oikawa and Suga definitely, Daichi as well, Asahi, Yachi, aw man... just the whole cast. Can't pick absolute faves. They're all great! Haha. Thank you for the request in the first place! How are you liking Haikyuu!! so far? Who's your fave ship by the way? 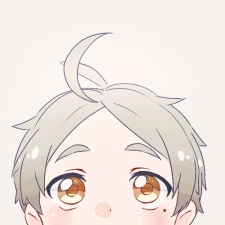 Is that a chibi Sugawara in your profile pic? It's sjoooooo cuuute!! !